In our laboratory, we utilize computational methods to study the properties and behavior of biomacromolecules and ligand-biomacromolecule complexes, and to aid in the design of small molecule ligands with desired binding properties for targeted receptors. 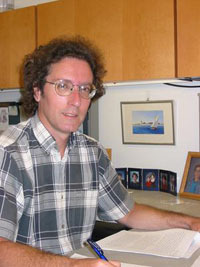 Techniques used include quantum mechanical calculations, molecular dynamics and Monte Carlo simulation, and free energy perturbation methods. Computational methods complement experimental techniques and can enhance our understanding of biomacromolecular function.